It probably seems a little odd to be reviewing the Pure One Flow in 2015 - a radio that has been out and about since 2011. However, with the BBC's recent updates to the way it makes its live radio and listen again programmes available, the choice of internet radio receivers that are compatible with the public service broadcaster's changes has markedly diminished. The One Flow gets regular, timely firmware updates, the latest of which has been downloadable since December 2014, which means streaming issues can be sorted out and new features introduced, adding to the radio's longevity. It's one of just a handful of products that, at this time, can successfully stream the BBC's high-quality HLS radio streams and on-demand content, following a decision by the broadcaster to choose a different method of providing high-definition radio streams. Pure One Flow is a DAB, FM and internet-enabled radio. Finished in a warm-touch matt black finish (and also in a white finish), the radio not only picks up thousands of radio stations around the globe, but - in the darker colour at least - its fair share of fingerprints. It's a light and - with an optional battery pack installed - portable receiver. A telescopic aerial does the job of picking up even distant DAB and FM radio stations, while a built-in wi-fi stubby aerial grabs signals from your router, and is responsible for streaming radio access. 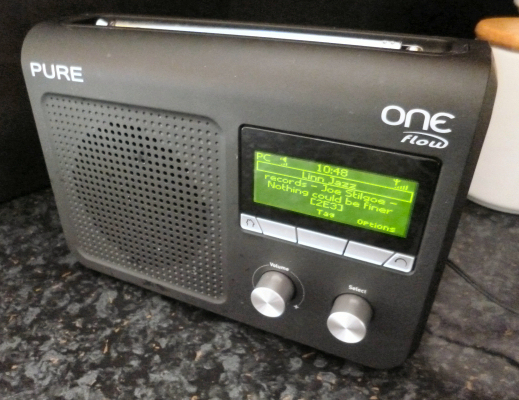 The One Flow has a legible yellow-on-black display and a series of rotary and button controls giving access, amongst other things, to Pure Connect - an online portal where you can add favourite online radio stations, podcasts and catch-up (listen again) programmes and shows from around 27,000 stations. 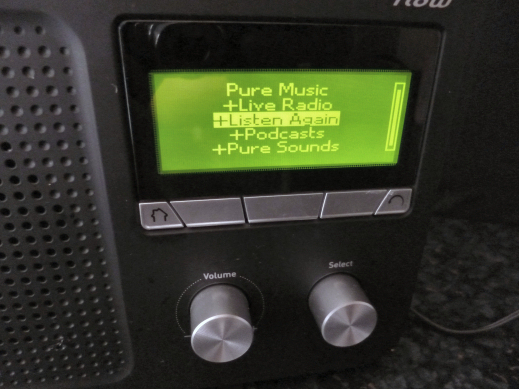 The radio's features are accessed by a series of menus - simply hit the home button and you'll be taken to options to listen to DAB digital radio (including DAB+ compatibility), FM and internet radio (it's labelled Pure Connect here). The radio can also stream music from your collection over uPnP from your home PC or Mac, or from a Windowsphone when using the Lumia PlayTo app, for example. There's an AUX input option for audio cable connections from your 'phone, letting you play music stored on an mp3 player or other device to the One Flow, but there's no wireless Bluetooth connectivity. Thanks to its popularity and diverse output, many of the most popular on-demand or listen again programmes originate from the BBC. 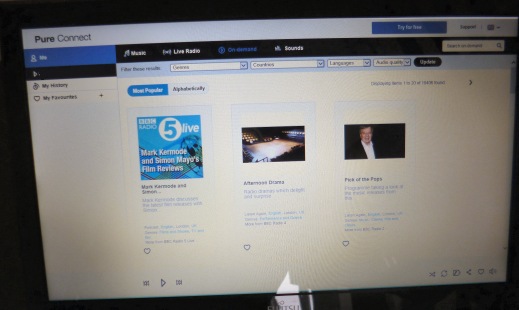 Create an account at Pure Connect using PC, Mac or tablet and you can search out podcasts, listen again and catch-up shows and programmes and add them as favourites, which will show up on the One Flow's display when you put in a unique code to register the radio to your Pure Connect account. While the Pure Connect app can be a little slow and unresponsive, it does at least allow you a way to filter out the good stuff you want from other, lacklustre content. It is possible to do the same on the radio, but the search function on the unit tends to be a more hit-and-miss affair, as accurate search terms are required. However, on the unit you can drill down into lists of stations by name, genre, location, language and even audio quality (bitrate) - though the latter simply brings up a scale of "1" to "5", of which BBC Radio 3 is listed under "4", for example. There are several hundred overseas stations which reach the upper scale for audio quality, scoring a "5". The Pure Connect website allows you to arrange favourite stations into folders or "labels" - so you might have a labelled folder for UK stations, or for overseas classical and jazz stations, for example. This makes it easier to find what you want on the One Flow, as the radio echoes these folders on its display for easier perusal. Further favourites can be added to or removed from the radio itself at the push of a button on the front of the unit. Wi-fi sensitivity is pretty good, but you can add a wi-fi repeater to boost the signal if your router is some distance from the radio. The radio features two "clicky" rotary controls - handy when scrolling quickly through stations - and "home" and "back" buttons to make navigation easier. 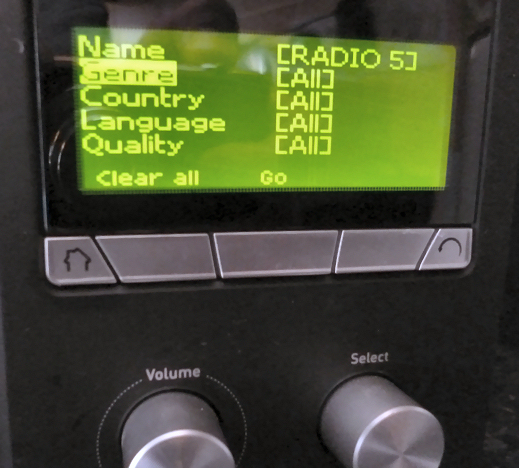 Three context-sensitive buttons let you add favourite FM, DAB, DAB+ and internet stations to separate lists, although when these banks are full on DAB and FM you have to remember to remove an old preset first in order to make space for a new one. The usefulness of the radio is enhanced by two separate fully-programmable alarm timers (wake to any DAB, DAB+, FM or internet radio station at a volume level that can be set, in a combination of daily, weekday or weekend settings for each of the two alarms) and a dimmable display with adjustable sleep and kitchen countdown timers. The One Flow also features a headphone socket, which means that you can also hook it up to a hi-fi system or listen in stereo using some cans. The former is where the One Flow excels - if you want to pipe a high-definition station like BBC Radio 3, Linn Jazz or Naim Radio to your amplifier and speakers, you can do that, too. If you want to move the radio about, even if you don't have a battery pack installed, the One Flow is quick to find your network and start streaming or playing the last station selected, when you plug it back in. We found zero cut-outs to spoil the audio during our testing period with lots of different, high-quality stations (which usually consume the most data and are more unforgiving of internet drop-outs). BBC listen again and podcast content are listed separately under the radio's menus, but again it's Pure Connect where you'll find it easiest to add and remove programmes. You'll find it easier to track down 6 Music's Steve Lamacq or Radcliffe & Maconie's weekday shows using the Pure Connect portal, for example. The One Flow will then display all shows available to stream, typically of broadcasts covering the last 7 days. It's easier to set up favourite stations, catch-up programmes and podcasts using the Pure Connect portal, where content is arranged by popularity or alphabetically. There's also a search box here, too. A significant drawback is the lack of any fast-forward, pause or rewind functions for catch-up. If you've a reliable internet connection this is usually not an issue (and you can get an ethernet link by plugging a special mini ethernet USB cable into the One Flow to avoid any potential wi-fi breaks), but should there be any interruption in the programme, the podcast or programme starts again from the beginning, which is really frustrating. Let's hope firmware upgrades might be able to address this problem, by offering pause and skip features. The sound from the One Flow is well balanced and authoritative; the ability to hook it up to other speakers also scores highly in its favour. Plug in a decent pair of Sennheiser headphones and internet radio's advantages over FM become apparent: there's no hiss, quiet passages in the music are just as intended and, with high-definition, high-quality 320Kbps MP3 or AAC stations, sound quality is very convincing for such a relatively inexpensive streamer. Talk shows benefit from the 3.5 inch speaker driver housed within. It's really different to hear some lovely, uncompressed music in contrast with the loud, brash output that most pop stations are set up to broadcast. Quite unbelievably, as of February 2015, the only conventional way to access the BBC's live sports coverage, when the BBC can't stream broadcasts to overseas listeners due to contractual rights, is via the DAB tuner on the One Flow. World Cup Cricket and even the Davis Cup are only broadcast over the airwaves on DAB digital radio or via the BBC Radio Player app on smartphones, PCs or Macs, meaning sports enthusiasts residing in the UK are treated to a repeating message on the One Flow as the whole listening process descends into a lottery. Read on, though, because there is a way to get these stations in full on your One Flow. One wonders if someone at the Beeb isn't pressing the right buttons to allow the correct high-quality HLS sports stream through (which the One Flow can handle), or if Pure have mistakenly added the international flavour mp3 to the UK-orientated Pure Connect portal, which seems more likely. In DAB reception areas, this isn't an issue, as you can simply re-tune to 5 Live or 5 live sports extra on DAB digital radio, but the attraction for sports enthusiasts of having an internet receiver is completely diminished by this oversight. Lucky, then, that you can add custom stations when logged in to the Pure Connect portal. So, if you know the BBC's HLS Stream, you can click on the little "+" key next to "my favourites" (using Internet Explorer only) to add a name, description, genre and URL. With thanks to Digital Spy's forum contributors, the stream addresses can be found here (post #138). The 5 Live and Sports Extra feeds played fine on the One Flow and show under whichever label you chose. The Pure One Flow saw an update in December 2014 to handle the BBC's new HLS streams (basically an AAC stream wrapped up in code), which the corporation will be using for its live radio and listen again streams moving forward. This has allowed the radio some future-proofing with the BBC's changes. If you want something different to the standard fayre of stations found on DAB and FM, with the benefit of BBC catch-up, on-demand and podcasts and a huge selection of stations from around the world, including rock, country, jazz and classical music stations, many broadcasting in high-quality and without commercials, the Pure One Flow is a good choice for internet streaming without having to power on or tie-up your smartphone, tablet, power-hungry laptop or desktop computer. It even comes with a 3 year warranty, which gives confidence in the radio's longevity and build quality - just send it back during this period if something should break. The radio measures in at 207mm wide x 147mm high x 80mm and turns up 2.5 Watts of audio power. It uses less than 1 Watt of power when in complete standby mode (hold down the power button for 7 seconds), or 2.2 Watts when in sleep mode. The display can be fully dimmed for use in the bedroom, on both standby and when the radio is being used. The dimmed display is perfectly readable for night use, but won't light up the room. The UK version picks up all DAB digital radio broadcasts in this country and has been awarded the digital radio tick, which means it's ready to pick up DAB+ broadcasts when a handful launch in February 2016 in the UK. The Pure One Flow is still available at under £99 - check below to find out where to get one. Radio Digital (DAB/DAB+/DMB-Radio), FM and internet radio (Wi-Fi). Wireless 802.11b and 802.11g supported with WEP and WPA/WPA2 encryption. 0.5 MB broadband speed recommended. Speaker full-range 3.5" drive unit. Audio power output 2.5W RMS. Input connectors 5.5V DC power adaptor socket (adapter supplied). 3.5mm line-in for auxiliary devices. USB (mini-AB type) for product software updates (also available over Wi-Fi). Output connectors 3.5mm stereo headphone socket. Controls 3 context-sensitive buttons. Rotary volume, rotary navigate/select. Mains power supply 100-240V, 50/60Hz 5.5V DC external power adapter. Battery power ChargePAK E1 rechargeable battery pack (available separately). Aerial Captive telescopic aerial; internal Wi-Fi aerial.